Paracrine and juxtacrine cellular interactions play an important role in many biological processes, including tumor progression, immune responses, angiogenesis, and development. Here, a proximal culture method is used to study paracrine signaling where the localized concentrations of the secreted factors are maintained while preventing direct cellular contact. Dasari, S., Pandhiri, T., Haley, J., Lenz, D., Mitra, A. K. A Proximal Culture Method to Study Paracrine Signaling Between Cells. J. Vis. Exp. (138), e58144, doi:10.3791/58144 (2018). Intercellular interactions play an important role in many biological processes, including tumor progression, immune responses, angiogenesis, and development. Paracrine or juxtacrine signaling mediates such interactions. The use of a conditioned medium and coculture studies are the most common methods to discriminate between these two types of interactions. However, the effect of localized high concentrations of secreted factors in the microenvironment during the paracrine interactions is not accurately recapitulated by conditioned medium and, thus, may lead to imprecise conclusions. To overcome this problem, we have devised a proximal culture method to study paracrine signaling. The two cell types are grown on either surface of a 10 µm-thick polycarbonate membrane with 0.4 µm pores. The pores allow the exchange of secreted factors and, at the same time, inhibit juxtacrine signaling. The cells can be collected and lysed at the endpoint to determine the effects of the paracrine signaling. In addition to allowing for localized concentration gradients of secreted factors, this method is amenable to experiments involving prolonged periods of culture, as well as the use of inhibitors. While we use this method to study the interactions between ovarian cancer cells and the mesothelial cells they encounter at the site of metastasis, it can be adapted to any two adherent cell types for researchers to study paracrine signaling in various fields, including tumor microenvironment, immunology, and development. The role of productive reciprocal interactions between cancer cells and the tumor microenvironment in tumor progression has been well established and has become a major focus of research in cancer biology1. Similar instances of bidirectional signaling are crucial during wound healing, immune responses, angiogenesis, stem cell niches, and during development2,3,4,5,6,7,8. A common theme in all these biological processes is that cells respond in various ways to extracellular cues from their microenvironment which determine cell fate, tissue physiology, and disease progression. Therefore, the focus has increasingly turned toward developing a better understanding of the mechanisms involved in such cell-cell communications. A majority of such interactions involve paracrine or juxtacrine signaling between cells. Paracrine signaling involves the secretion of specific signaling factors by one cell which are perceived by corresponding receptors on another cell in the vicinity, triggering a response in it9,10, whereas juxtacrine signaling requires direct contact between cellular components of the two cells involved11,12. Such signaling is a crucial component in tissue homeostasis, as well as in the tumor microenvironment. The cancer cells benefit from paracrine and juxtacrine factors from cells in the tumor stroma, including cancer-associated fibroblasts (CAFs), immune cells, and adipocytes13,14,15,16. The paracrine signaling can be mediated by growth factors, cytokines, chemokines, etc., while the juxtacrine signaling involves juxtaposed ligands and receptors as in Notch signaling, or interactions between integrins and their respective extracellular matrix proteins. We have demonstrated the importance of reciprocal interactions between ovarian cancer cells and CAFs in tumor progression and metastasis14. Similarly, the interactions of metastasizing ovarian cancer cells with the mesothelial cells covering the site of metastasis regulate key microRNAs and transcription factors in the cancer cells which promote metastatic colonization17,18. Most studies on paracrine signaling involve the use of a conditioned medium collected from one cell type to treat the second cell type with. While this approach has been widely used, it does not effectively replicate the localized high-concentration levels of the secreted factor in the microenvironment of the receiving cell. It also fails to reproduce the kinetics of the continuous flow of the secreted factor being produced by one cell and received by the neighboring cell. Paracrine signaling is effective over short distances as the secreted factors are at the required concentrations only in the vicinity of the source cell and tend to diffuse and dilute out as the distance increases. This localized high concentration of the secreted factor is essential to trigger a response in the receptor cell. Moreover, the response in the recipient cells is also dependent on the balance of newly secreted factors and their continuous depletion through degradation, binding, and internalization in the recipient cells and diffusion away from the source cell. Conditioned medium can be concentrated to account for the higher localized concentrations present in the microenvironment, but that cannot accurately replicate the exact concentrations. Moreover, it cannot mimic the natural kinetics of production and depletion of the factor involved. To more accurately replicate paracrine signaling and separate it from juxtacrine signaling mechanisms, we have devised a novel proximal culture method, which involves growing the two cell types on either surface of a porous membrane. The pores are small enough to prevent juxtacrine interactions and yet allow the exchange of secreted factors at localized high concentrations. In that way, this system retains the kinetics of production and depletion of the paracrine factors. The protocol follows the guidelines of the Institutional Regulatory Board of Indiana University. Isolate human primary mesothelial cells (HPMCs) from human omentum as described previously17,18 and grow them in complete growth medium [Dulbecco’s Modified Eagle’s Medium (DMEM) containing 10% fetal bovine serum, 1% penicillin-streptomycin, 1% non-essential amino acids, and 1% vitamins] at 37 °C and 5% CO2. NOTE: The HPMCs are typically grown to 100% confluence (Figure 1A). Grow HeyA8 ovarian cancer cells in complete growth medium at 37 °C and 5% CO2. NOTE: Use HeyA8 cells grown to about 80% confluence (Figure 1B). Use Transwell inserts for 6-well plates with a 10 μm-thick tissue-culture-treated polycarbonate membrane with 0.4 μm pores (108 pores/cm2) and a 4.67 cm2 growth area. If needed, optimize for different insert sizes by scaling the number of cells seeded according to the growth surface area. Warm complete growth medium, trypsin, and phosphate-buffered saline (PBS) to 37 °C before use. To seed the HeyA8 cells on the lower surface of the membrane of the insert, remove the insert from its packaging using sterile forceps and place it inverted in a sterile 15 cm culture dish. Use a 15 cm dish, as it has the depth to accommodate the inverted insert, or substitute it with any appropriate sterile container. Depending on the experiment, place the required number of inserts in the 15 cm dish. Label the three controls and three experimental conditions accordingly with a marker on the edge of the inserts. To trypsinize the HeyA8 cells grown at 80% confluence in a 25 cm2 flask (~2 x 106 cells), add 1 mL of trypsin (0.25%) for 40–60 s and neutralize the trypsin with 6 mL of complete growth medium. Centrifuge the cells at 500 x g at room temperature (RT) for 3 min, discard the supernatant, and resuspend the cell pellet in 5 mL of complete growth medium. Count the live cells using the trypan blue dye exclusion method. Suspend 100,000 cells/mL of live HeyA8 cells in complete growth medium. Carefully seed 80,000 HeyA8 cells suspended in 800 μL of complete growth medium on the bottom of the insert (which is now facing up, since it is inverted). Seed the cells to form a dome-like shape so the cells remain on the insert (Figure 1C). Start from the center of the membrane and move outward in concentric circles while slowly pipetting. Avoid going more than 3 mm from the edge to prevent any spilling of the medium. NOTE: The number of cells seeded will depend on the growth rate of the cells and the duration of the experiment. The number of HeyA8 cells seeded for this proximal culture were optimized and the cells will be 80–90% confluent at the end of the third day. Cover the 15 cm dish and carefully move the dish containing the inserts to the CO2 incubator. It is critical not to disrupt the drop of medium and cells on the insert at this step. Leave the cells at 37 °C for 4 h to allow the cancer cells to attach to the insert. After around 4 h, trypsinize the HPMCs grown at 100% confluence in a 75 cm2 flask (~4 x 106 cells) with 2 mL of trypsin (0.25%) for 1–2 min and neutralize the trypsin with 12 mL of complete growth medium. Centrifuge the cells at 500 x g at RT for 3 min, resuspend the cell pellet in 10 mL of complete growth medium, and count the live cells using the trypan blue dye exclusion method. Suspend 300,000 cells/mL of live HPMCs in complete growth medium. Add 2.5 mL of fresh complete growth media to each well of a 6-well plate. Carefully bring the 15 cm dish containing the inserts out to the biosafety hood. Using sterile forceps, flip the insert and place it in the well of the 6-well plate so that it is upright, with the HeyA8 cells attached to the lower surface immersed in the complete growth medium (Figure 1C). Seed 450,000 HPMCs suspended in 1.5 mL of growth medium in the inside of the inserts with the HeyA8 cells attached to the surface facing the bottom of the well (Figure 1C) or to inserts without any HeyA8 cells for the HPMC controls. Add 1.5 mL of growth medium without cells to the HeyA8 controls. Let the proximal culture grow in the CO2 incubator at 37 °C and 5% CO2 for 72 h. If required, the medium can be replenished as follows. For the inside of the insert, remove 750 µL and add 750 µL of fresh complete growth medium. For the outside of the insert (the 6-well plate), remove 1 mL and add 1 mL of fresh complete growth medium. The 1 mL was chosen for the convenience of changing the medium in one step. If desired, 1.25 mL can be removed and replaced instead. Collect the cells after 72 h of proximal culture. Take special care at this step to prevent cross-contamination of the HeyA8 cells and HPMCs. Trypsinize the cells, centrifuge them, and lyse the pellet instead of lysing the cells on the membrane to prevent a cross-contamination. Rinse both sides of the insert with 1x PBS. Transfer the inserts to a new well and add trypsin. Add 0.5 mL of trypsin to the inside of the insert and add 2 mL of trypsin to the 6-well plate to trypsinize the cancer cells attached to the lower surface of the insert. Incubate the plate for 2 min at 37 °C. Add 1 mL of complete growth medium to the inside of the insert to neutralize the trypsin, pipette up and down, and then take the cells and transfer them to a labeled collection tube. Add an additional 2 mL of complete growth medium for a complete neutralization. Care should be taken not to pierce the membrane while pipetting to prevent a cross-contamination of the cells. To collect the cells on the bottom of the insert, pipette the 2 mL trypsin that was added in step 12.2 onto the bottom surface 2–3x so that the cells fall into the bottom of the 6-well plate. Neutralize the trypsin on the bottom of the plate with 6 mL of growth medium and transfer the contents of the plate to a labeled collection tube. Centrifuge the cells at 500 x g for 3 min and aspirate the media. Resuspend and lyse the cell pellets with 0.7 mL of phenol- and guanidine-thiocyanate-based lysis reagent for the RNA extraction. Isolate the RNA using any suitable kit. NOTE: The following steps describe a quantitative real-time polymerase chain reaction (qPCR) to study the gene expressions changes as a result of the proximal culture. Prepare cDNA from the RNA samples for qPCR. Use any suitable reverse transcriptase with a corresponding buffer and random primers to ensure the reverse transcription of all mRNA (see Table of Materials). Assess the changes in the mRNA expression levels of fibronectin (FN1) and E-cadherin (CDH1) and transform growth factor beta 1 (TGFβ1) by qPCR with glyceraldehyde 3-phosphate dehydrogenase (GAPDH) as an internal control. It is possible to use standardized commercially available gene expression assays (see Table of Materials) or to design primers. Compare the HeyA8 cells grown in proximal culture with HPMCs with the HeyA8 controls and the HPMCs grown in proximal culture with the HPMC controls. Metastasizing ovarian cancer cells encounter mesothelial cells at the site of metastasis within the peritoneal cavity19. Productive paracrine and juxtacrine interactions with the mesothelial cells help in inducing adaptive responses in the ovarian cancer cells, which enable successful metastasis17,18,20,21. To test the effectiveness of the proximal culture method, we tested the paracrine interactions between HeyA8 ovarian cancer cells and HPMCs. It has previously been reported that a coculture of HeyA8 cells with HPMCs results in an increased expression of fibronectin in the HPMCs21. This induction of fibronectin expression is mediated by an increased secretion of TGFβ by the HeyA8 cells21. Therefore, we tested the effect of a proximal culture of HeyA8 cells and HPMCs on the mRNA levels of fibronectin and TGFβ in both these cells. As expected, proximal culture with HeyA8 cells resulted in an increased expression of fibronectin in the HPMCs compared to controls that were seeded on inserts without HeyA8 cells attached to the lower surface (Figure 2A). Similarly, the proximal culture of HPMCs with HeyA8 cells resulted in an increased expression of TGFβ in the former (Figure 2B). The expression of both fibronectin and TGFβ also significantly increased in HeyA8 cells upon proximal culture with HPMCs as compared to controls where HPMCs were not seeded in the upper surface of the inserts (Figure 2C and 2D). To compare the effect of the classic conditioned medium approach, we performed an experiment treating HeyA8 cells with an HPMC-conditioned medium. There was a decrease in fibronectin expression and a significant change in TGFβ in HeyA8 cells treated with the HPMC-conditioned medium. (Figure 3A and 3B). We also tested the potential of blocking the secreted TGFβ with a neutralizing antibody in the proximal culture. Treatment with the TGFβ neutralizing antibody resulted in a significant decrease in the induction of TGFβ in HeyA8 cells in proximal culture with HPMCs (Figure 3C). However, the TGFβ neutralizing antibody slightly increased the TGFβ expression in the control HeyA8 cells, probably as a compensatory response (Figure 3C). In addition, we also tested the effect of proximal culture on the expression levels of the epithelial marker E-cadherin. While proximal culture with HeyA8 cells slightly increased the E-cadherin expression in the HPMCs (Figure 2E), a marked decrease in E-cadherin was observed in HeyA8 cells grown in proximity of HPMCs as compared to controls (Figure 2F). Taken together, these results demonstrate the effectiveness of the proximal culture system in studying the paracrine signaling between ovarian cancer cells and the normal cells at the site of metastasis that affect gene expression in both cell types during the process of metastatic colonization. Figure 1: Assembly of the proximal culture system. (A) This panel shows human primary mesothelial cells (HPMCs). (B) This panel shows HeyA8 ovarian cancer cells. Scale bars = 200 µm (A-B). (C) HeyA8 cells were seeded on the lower surface of a transwell insert with 0.4 µm pores. Once the cells were attached, the insert was placed in a well of a 6-well plate containing growth medium. 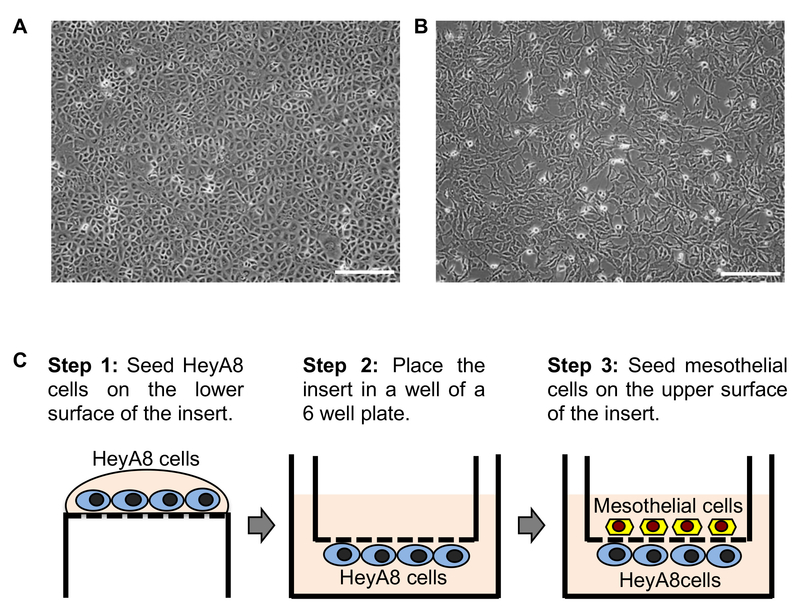 Mesothelial cells were then seeded in the insert so that they attached to the upper surface and were separated from the HeyA8 cells by the membrane. The 0.4 µm pores in the membrane allowed the exchange of secreted factors but inhibited any direct contact between the cells. Please click here to view a larger version of this figure. Figure 2: Effect of the proximal culture on mRNA expression. The first two panels show the qPCR for the (A) fibronectin and (B) TGFβ1 expression in human primary mesothelial cells (HPMCs) cultured proximally to HeyA8 cells, compared to control HPMCs. The next two panels show the qPCR for (C) fibronectin and (D) TGFβ1 expression in HeyA8 cells cultured proximally to HPMCs, compared to control Heya8 cells. The last two panels show the qPCR for the E-cadherin expression in (E) HPMCs cultured proximally to HeyA8 cells and (F) HeyA8 cells cultured proximally to HPMCs. N = 3, * p < 0.01. The error bars represent the standard deviation of the three repeats. Please click here to view a larger version of this figure. Figure 3: Effect of human primary mesothelial cell (HPMC)-conditioned medium treatment on the mRNA expression of HeyA8 cells. The top two panels show the qPCR for the (A) fibronectin and (B) TGFβ1 expression in HeyA8 cells. (C) This last panel shows the effect of inhibiting secreted TGFβ1 with a neutralizing antibody (TGFβ1 Ab) on the HeyA8 TGFβ1 expression upon a proximal culture with HPMCs. N = 3, * p < 0.01. ** p < 0.05. The error bars represent the standard deviation of the three repeats. Please click here to view a larger version of this figure. Understanding the mechanism of paracrine and juxtacrine signaling between cells is essential for developing a better knowledge of normal tissue homeostasis and disease conditions7,8. Most paracrine signaling studies are conducted by collecting conditioned medium from one cell type and using it to treat the other cell type. This method has an advantage in its inherent simplicity. However, it does not accurately recapitulate the localized concentrations of the secreted factors in the cellular microenvironment or the kinetics of production and depletion of the factors involved. While the former can be addressed to some extent, though not accurately, by concentrating the conditioned medium, it is very difficult to recreate the kinetics. The use of transwell inserts to grow cells in the insert and in the bottom of the well can, to some extent, recapture the effects of the kinetics of production and depletion. However, the cells are separated by the distance between the insert and the bottom of the well and, thus, cannot recreate the localized concentrations of the paracrine factors. We reported the development of a simple proximal culture method to study reciprocal paracrine signaling, which retained the localized high concentrations of the secreted factors, as well as the dynamics of the rate of production and depletion of the factors. In a proof-of-principle study, we demonstrated the effectiveness of the proximal culture method in reproducing the reported effects of interactions between ovarian cancer cells and HPMCs. In addition, we also showed the opposite effects of reciprocal paracrine interactions on the expression of the epithelial marker E-cadherin in HeyA8 cells and HPMCs. While our experiment involved culturing the cells over a period of 3 days, it can be adapted to shorter or longer time points by adjusting the initial number of cells seeded. This enables researchers to study short-term as well as long-term effects of the paracrine signaling or to perform time-course studies. This simple method can potentially be applied to any research on paracrine signaling between two adherent cell types, including immunology, angiogenesis, cell development, and wound healing, in addition to studies on the tumor microenvironment. The critical steps in this method are seeding the cells on the lower surface of the membrane and harvesting the cells from both surfaces at the endpoint. We achieved a seeding on the lower surface by first flipping the insert and then seeding the cells as a large drop of medium. The more adherent cell of the two studied should be seeded on the bottom surface. Care has to be taken not to disturb the insert while incubating it to avoid this blob of medium from disrupting. Silicone gel can be applied to the edges of the insert to avoid the busting and spilling of the bubble of liquid. At the end of the proximal culture experiment, the cells on both sides of the membrane are sequentially trypsinized instead of lysed directly, because lysing them on the membrane risks cross-contamination of the lysates through the pores. By trypsinizing them in their individual compartments and taking care that the medium and trypsin volume never exceeds the stipulated amount of the protocol, any cross-contamination is avoided. Each cell type is collected in a separate tube, centrifuged, and the cell pellet is then lysed. Although this technique allows the effective study of paracrine interactions while avoiding overt direct interactions, we cannot rule out interactions through tunneling nanotubules (TNTs). Some of these TNTs can be narrow enough to pass through the 0.4 µm pores and long enough to span the 10 µm thickness of the membrane. While our attempts to verify their presence in the pores by confocal microscopy were inconclusive (data not shown), electron microscopy could potentially be employed to confirm their presence. Therefore, this method does not rule out the potential cell-cell communication through TNTs if the candidate cells are capable of forming them and interacting through them. Similarly, we cannot rule out increased autocrine signaling as a result of the potential blocking of pores by cells on both sides of the membrane, preventing cross-diffusion. Growing cells on either surface of a membrane with 0.4 µm pores also allows the potential exchange of exosomes. Exosomes were traditionally considered as trash bags of cells, but recent research has indicated that these vesicles with their cargo of proteins, microRNAs, and even mRNAs and DNA serve as important mediators of paracrine cellular communications22,23,24. Therefore, the proximal culture method can be effectively used to study cellular communications through exosomes. In addition, this method is amenable to treatment with specific inhibitors of the signaling or neutralizing antibodies against the secreted ligand or corresponding receptor. In summary, we reported the development of a simple and versatile proximal culture method, which can accurately replicate paracrine signaling while preventing direct interactions between cells. The simplicity of this method enables its widespread application in diverse fields like cancer biology, development, and immunology. We are indebted to the patients for their participation in the tissue collection for these experiments. A DoD OCRP Ovarian Cancer Academy Award (W81XWH-15-0253) and a pilot award from Colleen's Dream Foundation to Anirban K. Mitra supported this research. Hanahan, D., Coussens, L. M. Accessories to the crime: functions of cells recruited to the tumor microenvironment. Cancer Cell. 21, (3), 309-322 (2012). Cupedo, T., Mebius, R. E. Cellular interactions in lymph node development. The Journal of Immunology. 174, (1), 21-25 (2005). Suvas, S. Role of Substance P Neuropeptide in Inflammation, Wound Healing, and Tissue Homeostasis. The Journal of Immunology. 199, (5), 1543-1552 (2017). Gnecchi, M., Danieli, P., Malpasso, G., Ciuffreda, M. C. Paracrine Mechanisms of Mesenchymal Stem Cells in Tissue Repair. Methods in Molecular Biology. 123-146 (2016). Lionetti, V., Bianchi, G., Recchia, F. A., Ventura, C. Control of autocrine and paracrine myocardial signals: an emerging therapeutic strategy in heart failure. Heart Failure Reviews. 15, (6), 531-542 (2010). Nicosia, R. F., Zorzi, P., Ligresti, G., Morishita, A., Aplin, A. C. Paracrine regulation of angiogenesis by different cell types in the aorta ring model. International Journal of Developmental Biology. 55, (4-5), 447-453 (2011). Pattabiraman, D. R., Weinberg, R. A. Tackling the cancer stem cells - what challenges do they pose. Nature Reviews Drug Discovery. 13, (7), 497-512 (2014). Plaks, V., Kong, N., Werb, Z. The cancer stem cell niche: how essential is the niche in regulating stemness of tumor cells. Cell Stem Cell. 16, (3), 225-238 (2015). Elenbaas, B., Weinberg, R. A. Heterotypic signaling between epithelial tumor cells and fibroblasts in carcinoma formation. Experimental Cell Research. 264, (1), 169-184 (2001). Wilson, K. J., et al. EGFR ligands exhibit functional differences in models of paracrine and autocrine signaling. Growth Factors. 30, (2), 107-116 (2012). Kopan, R. Notch signaling. Cold Spring Harbor Perspectives in Biology. 4, (10), (2012). Singh, A. B., Sugimoto, K., Harris, R. C. Juxtacrine activation of epidermal growth factor (EGF) receptor by membrane-anchored heparin-binding EGF-like growth factor protects epithelial cells from anoikis while maintaining an epithelial phenotype. Journal of Biological Chemistry. 282, (45), 32890-32901 (2007). Swartz, M. A., et al. Tumor microenvironment complexity: emerging roles in cancer therapy. Cancer Research. 72, (10), 2473-2480 (2012). Mitra, A. K., et al. MicroRNAs reprogram normal fibroblasts into cancer-associated fibroblasts in ovarian cancer. Cancer Discovery. 2, (12), 1100-1108 (2012). Nieman, K. M., et al. Adipocytes promote ovarian cancer metastasis and provide energy for rapid tumor growth. Nature Medicine. 17, (11), 1498-1503 (2011). Salimian Rizi, B., et al. Nitric oxide mediates metabolic coupling of omentum-derived adipose stroma to ovarian and endometrial cancer cells. Cancer Research. 75, (2), 456-471 (2015). Mitra, A. K., et al. Microenvironment-induced downregulation of miR-193b drives ovarian cancer metastasis. Oncogene. 34, (48), 5923-5932 (2015). Tomar, S., et al. ETS1 induction by the microenvironment promotes ovarian cancer metastasis through focal adhesion kinase. Cancer Letters. 414, 190-204 (2018). Mitra, A. K. Ovarian Cancer Metastasis: A Unique Mechanism of Dissemination. Tumor Metastasis. Xu, K. InTechOpen. Available from: https://www.intechopen.com/books/tumor-metastasis/ovarian-cancer-metastasis-a-unique-mechanism-of-dissemination 43-58 (2016). Iwanicki, M. P., et al. Ovarian cancer spheroids use myosin-generated force to clear the mesothelium. Cancer Discovery. 1, (2), 144-157 (2011). Kenny, H. A., et al. Mesothelial cells promote early ovarian cancer metastasis through fibronectin secretion. Journal of Clinical Investigation. 124, (10), 4614-4628 (2014). Boelens, M. C., et al. Exosome transfer from stromal to breast cancer cells regulates therapy resistance pathways. Cell. 159, (3), 499-513 (2014). Kalluri, R. The biology and function of exosomes in cancer. Journal of Clinical Investigation. 126, (4), 1208-1215 (2016). Kohlhapp, F. J., Mitra, A. K., Lengyel, E., Peter, M. E. MicroRNAs as mediators and communicators between cancer cells and the tumor microenvironment. Oncogene. 34, (48), 5857-5868 (2015).